How Does Solar Add Value To My Home? What's a Prepaid Solar Lease? Hiring a roofing contractor can be scary, but you'll be well prepared once you know the tricks they try to play on you. 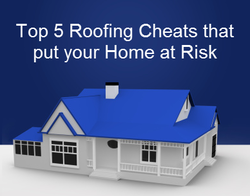 Here are my Top 5 Roofing Cheats that put your Home at Risk. Unscrupulous contractors will bait and switch with all kinds of roofing components and accessories. They'll swap in low grade shingles that look like the premium brand name you bought, just to rip you off and pocket a higher profit. I've inspected homes where an owner presumed they had a 50 year grade roof they purchased years ago, but it's obvious to me the roofer swapped in a 25 year shingle. For example, see that part on your contract that reads “Install #30 pound felt paper underlayment”. That’s the black looking tar paper you see rolled onto a roof just before the shingles are installed. What you may not know is there are inferior, cheaper grades of underlayments. Like #15 pound felt paper that looks almost identical to a #30 pound felt. If your roofer sneaks that #15 felt paper onto your roof instead of the #30 he sold you, he can put as much as few hundred more dollars into his pocket. I know of competitors that rip those #30 labels off of the felt before installing them on your neighbor's home. They’ll save the #30 labels and stick them on cheap grade felt right before delivering it to your home....just in case you actually try to inspect the materials once they’re on site. That's shady. When materials are being loaded onto your home's roof, get up there and snap pictures as soon as you can. Inspect the labels and shingle wrappers. It can be difficult to climb a ladder and get on your roof, I know. Hand the camera to your roofer and ask him to fire off some photos for you. If he acts at all nervous or refuses to do so, you might have a problem.This is a common cheat because it's hard for owners to catch their contractor switching out high grade components with low grade ones. You've obtained roofing bids from a few companies and you’re feeling pretty good about what you've budgeted for your project. Hopefully there aren't any surprises that arise once construction has commenced. Most of what I call "Roof Surprises" are excluded from your roofing agreement and involve wood rot or fungus, maybe sagging of roof rafters or other problems that can't easily be identified before stripping off your old roof. This is where roofers can nail you with extra charges to fix those surprises with what's typically called a "Change Order". You'll feel cornered because you've already hired him to replace your roof, and the demolition stage is complete. Now your contractor states he's performed an assessment of the roof's substrate and he's found all kinds of roof surprises that need fixing. He may hit you with a $2,000 change order to make all those repairs before getting started on the rest of the roof. What he may not tell you is that it's only going to take 2 hours labor and $100 in new plywood to make those repairs! Did you see that coming? Deceitful roofers often plan to generate the majority of their profits through inflated change orders. To protect yourself, perform a visual inspection at the underside of your roof eaves before you interview roofers. If you notice wood rot or something you feel might need to be addressed, see if the roofer makes note of it before bringing it to his attention. He may ignore it initially so he can force you into a healthy change order down the road if you hire him. Ask what kind of roof surprises he's experienced on other homes in the neighborhood. Many of these unforeseen extras can be diagnosed ahead of time by a reputable roofing company. You'll then be able to include the cost of those repairs at a fair price in your agreement before you start your project. This will lower your risk of getting hit with exorbitant change orders down the road. You've just finished re-roofing your home and you've paid your contractor in full. What if he skips out on paying for the materials used on your home improvement? There's a lot of roofing contractors out there operating in the red because of the economy. Perhaps he's unable to pay the subcontractor that installed the gutters on your home? Your roofer certainly isn't going to tell you any of this. In less than a month or two, you might receive a certified letter in the mail denoting a lien against your home. In California, this is a legal claim against your property and you’ll be legally responsible to pay back the supplier or subcontractor. I know it doesn't sound fair, but it’s the law. It’s called a “Mechanics Lien”. This is an excerpt taken directly from the California CSLB (Contractors State License Board) website. Wow. Most of my clients are unaware of this law when I first meet with them to consult on their project. John Schunzel of Cal Shingle & Shake is a roofing supplier in Concord, CA. He says, "We lien between 15 and 20 homes a year. That's why we send pre-lien notices to the owner and the contractor." The best way to prevent a mechanic’s lien from being place on your home is with a lien waiver or lien release. This is a legal document furnished by the material supplier or subcontractor. It denotes they've been paid in full by your prime contractor and agree to relinquish their rights to place a lien on your property. IMPORTANT TO NOTE: A lien waiver from your prime contractor is meaningless. Do not be fooled by a lien release that is from your prime contractor only. This guarantees only that he will not place a lien on your home, but why would he? You've already paid him. It won’t protect you in the event he doesn't pay his suppliers or subcontractors. A good way to avoid this is to ask your roofer which warehouse he’ll be purchasing materials from. Then call that supplier to inquire about that roofer’s reputation. Do they pay their bills on time? How many years have they been doing business with that roofer? If your roofer is hesitant to provide his supplier’s name as a reference, that’s a bid red flag. Walk away. This is the #1 cheat roofers use that may put you and your home at risk. Workers' Compensation rates are set by risk classifications. Guess which industry in California has the highest risk calculation? Roofing. And the lowest? Office clerks. That's fair. I can’t think of too many jobs more dangerous than roofing. After all, it does often require handling a pneumatic nail gun 20 feet off the ground on an uneven surface in 90 degree heat. As a result, California roofing contractors are required to pay large Workers' Compensation premiums to adequately insure their laborers. For every $100 spent on wages, a roofing contractor can expect to pay as much as $30 to $50 on workers' compensation insurance. Contractors that don’t secure the required amount of insurance can pocket as additional profits the amount of money that should have been spent on protecting their workforce. By falsifying payroll reports and paying employees in cash, a contractor can reduce the amount of money spent on insurance premiums. This risk you incur is this: Very few experienced and skilled roofers will agree to work for a company that skimps on its workers' compensation insurance. That’s why you see so many roofing companies motivated to use unskilled, and undocumented laborers picked up off the street to work on your home. They're paid in cash and if they get hurt, they're left out to dry and the roofer doesn't have to worry about a workers' compensation claim. But did you know that you as the homeowner can be held liable for an uninsured worker’s medical bills if he is injured while working on your home? Utilizing this classic roof cheat, an unsavory roofing company can bid your home thousands of dollars cheaper than an honest competitor or pocket a few extra grand. In the end you'll have a new roof installed by day laborers with little to no experience. Any way you slice it, you put your home and your pocketbook at risk when hiring the wrong roofer.